This tapestry "The Battle of Anghiari" is based on the lost painting of Leonardo da Vinci from 1505. Filled with action and drama, this piece shows three men on horses battling to win possession of a heraldic flag. In the year before in 1504 Soderini commissioned Da Vinci to decorate the Hall of Five Hundred which was to hold meetings of 1000 citizens on two rotations to increase the participation of the people in government. Michaelangelo was commisoned to decorate the wall opposite. This was the only time where Da Vinci and Michaelangelo worked on the same project. Michaelangelo however did not complete the project as he had finished the sketches but had only just began the painting. Da Vinci on the other hand began this painting which was to be his largest work, but abandoned it because of technical difficulties with the paint not drying rapidly enough and creating a mingling of colors. Both their unfinished works were in the same room for over a decade. The hall was eventually refurbished and the incomplete paintings by Da Vinci and Michaelangelo are purported to be hidden behind panels somewhere in the hall itself, which as still undiscovered to this day. A masterpiece by the great master, the illustration of this battle scene is the surviving work that tells the tale of this great painting that was to be his largest. 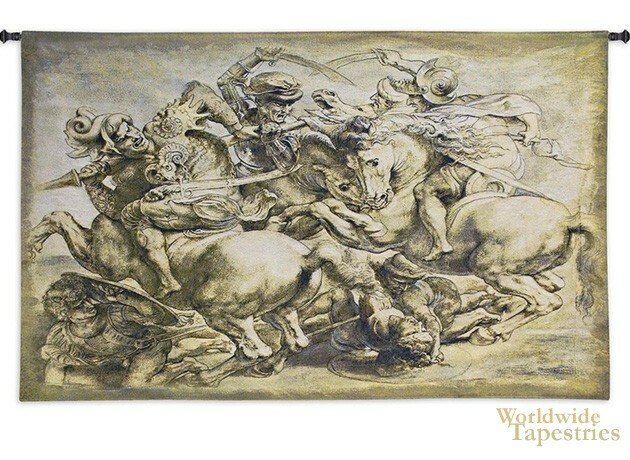 This fine art tapestry "The Battle of Anghiari" is backed with lining and tunnel for ease of hanging. Note: tapestry rod and tassels, where pictured, are purchased separately. Dimensions: W 62" x H 38"
Dimensions: W 92" x H 63"